This paper is an invitation to carry out science and engineering for a class of socio-technical systems where individuals — who may be human or artificial entities — engage in purposeful collective interactions within a shared web-mediated social space. We put forward a characterization of these systems and introduce some conceptual distinctions that may help to plot the work ahead. In particular, we propose a tripartite view (WIT Trinity) that highlights the interplay between the institutional models that prescribe the behaviour of participants, the corresponding implementation of these prescriptions and the actual performance of the system. Building on this tripartite view we explore the problem of developing a conceptual framework for modelling this type of systems and how that framework can be supported by technological artefacts that implement the resulting models. The last section of this position paper outlines a list of challenges that we believe are worth facing. 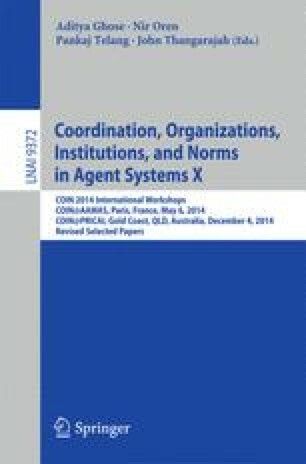 This work draws upon the contributions that the MAS community has made to the understanding and realization of the concepts of coordination, norms and institutions from an organisational perspective. The authors wish to acknowledge the support of SINTELNET (FET Open Coordinated Action FP7-ICT-2009-C Project No. 286370) in the writing of this paper. In addition, d’Inverno acknowledges the support of the FP7 Technology Enhanced Learning Program Project: Practice and Performance Analysis Inspiring Social Education (PRAISE).